HP is on track to start sales of laptops featuring a 15.6-inch AMOLED display in April, the company said recently. The first systems to get the innovative screens will be the company’s Envy and Spectre convertible notebooks that will first be available in Europe and the US. 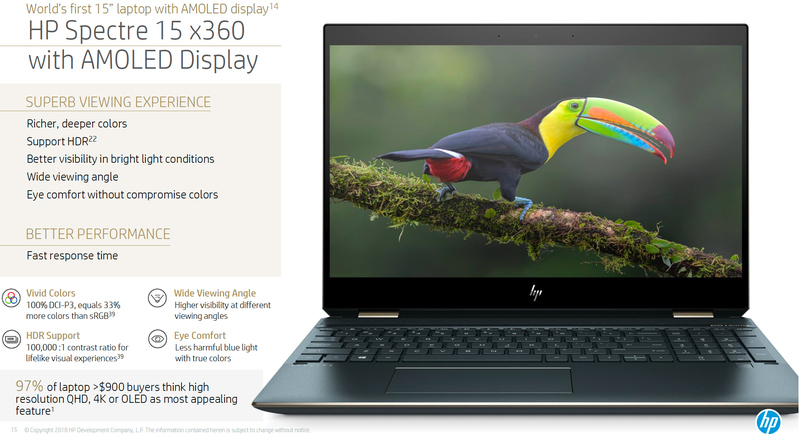 HP introduced the Spectre x360 15, its first laptop with a 15.6-inch AMOLED display, back at CES 2019. Last week the company disclosed that apart from the said machine, it will also offer a premium version of its Envy x360 15 featuring the same panel. HP will reveal exact specifications of its ultra-thin 15.6-inch laptops with AMOLED displays at a later date, the only thing we do know about them at this time is that they will be based on Intel’s Core ‘Whiskey Lake’ CPUs. Meanwhile, given premium pricing of AMOLED screens, it is reasonable to expect these machines to be offered with other high-end components (GPU, SSD, Wi-Fi, etc.). The manufacturer plans to start selling the HP Spectre x360 15 convertible via HP.com on April 19 with retail availability through Best Buy expected in May. The Envy x360 15 convertible laptop will be available next month in Europe first, whereas its US launch date will be announced separately, the company said. 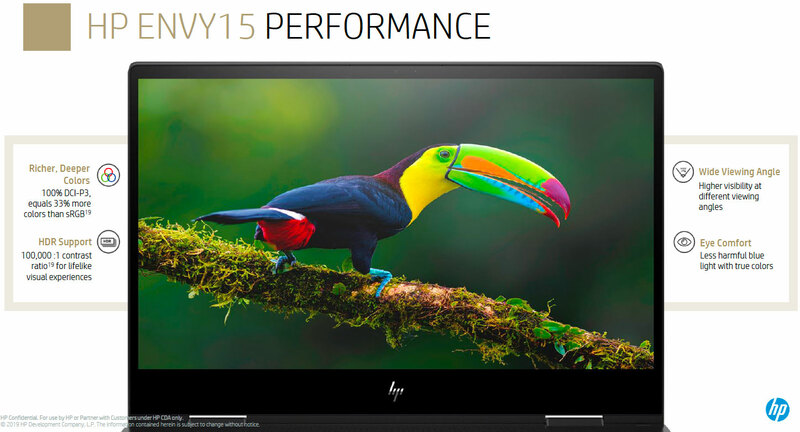 Interestingly, HP also has not published many details about the 15.6-inch AMOLED panel it plans to use. So far the only company that has announced a 15.6-inch AMOLED display for laptops so far is Samsung Display. This panel has a 3840×2160 resolution, a brightness level ranging from 0.0005 to 0 nits, a dynamic contrast ratio of 0,000:1, a very low response time, and wide horizontal viewing angles. The screen can reproduce 100% of the DCI-P3 color gamut, which is considerably more accurate when compared to LCDs available today. Furthermore, the monitor carries VESA’s DisplayHDR True Black badge thus supporting at least HDR10 spec. Keep in mind though that HP might use a different panel or different grade of panel.